I'm at this pub right now and sorely disappointed. It seems your review was optimistic to say the least. There are 2 Mongolian options on the menu: beef and noodles and dumplings. The clientele is men watching football shouting and swearing. One pint and we're off. Shame, because I really like your blog and I have visited some of the really interesting places you've recommended. Sorry to hear you didn't get on too well G. It's certainly not a traditional Mongolian experience, but there are lots of options if you ask for the specific Mongolian menu, and there is also a separate Mongolian Dim Sum menu, and it's good value. That said, it is a pub, and a great spot to watch sport, so on a Saturday afternoon you should expect loud people watching football, especially given the location. Re-reading my comment, I noticed that I was a bit harsh. I'm sorry... I think I was just disappointed and tired after a afternoon at the V&A. I wanted somewhere quiet to enjoy a different meal. Anyway, the camera-less exhibition at the V&A is amazing and only a fiver! Thanks, and I'm definitely grateful for your feedback either way. 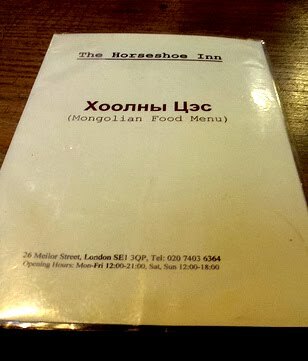 Hi Tom, thanks for advertising Mongolian cuisine in your blog. I come from Mongolia, favorite hobby of mine is cooking food in "original way". I hope you understand what I mean by that. So, food you had tested there is kind of twist for foreigners, reason being, the quality of meat is far different in Mongolia than what we consume here.